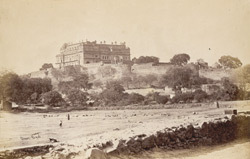 Photograph of the Rajgarh Palace at Datia in Madhya Pradesh, taken by Deen Dayal in the 1870s. Datia was the capital of the principality of the same name under the Bundela Rajputs in the 16th and 17th centuries. The Rajgarh Palace, seen in this view, is situated west of the old palace known as Nrising Dev Palace or Govind Mandir (c.1620). It was built by Subhakaran and accomodates governments offices.